January 28, 2019 – A new year means new leadership on the GJEP Board of Directors. This year, we are fortuna te to have longtime economic development supporter and community leader Doug Simons, Enstrom’s President, as our Chairman. His second-in-command is none other than the GJ Chamber “Citizen of the Year” Quint Shear of Shear Inc. Doug and Quint are exemplary of the incredible business community leaders that make up the GJEP board – see the full cast here. 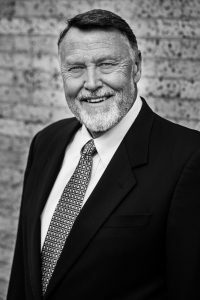 After being involved in our local business scene for forty trips around the sun and now being elected by the diverse and talented, all-volunteer board of the Grand Junction Economic Partnership (GJEP) as the Chairman for 2019, I thought it appropriate to reflect on the importance of proactive economic development. I was very fortunate to get an early education from some great current and former community leaders when I got a seat on the Mesa County Economic Development Council (MCEDC) in the mid-eighties. Jim Kennedy, Denny Granum and Ken Nesbitt were the early thought leaders who came up with the idea to raise money to promote the area and recruit new businesses after the vacuum that was created by Exxon pulling out and causing the notorious Black Monday back in 1982. That year, some 700 families left the Valley and numerous real estate investors were annihilated during the devastating downturn. The need to do something was very evident, and the idea was to be proactive and make something happen to bring our community back. The formation of the MCEDC was the brainchild of a powerful group of leaders at the time, like the three aforementioned initiators, along with Brian Mahoney, Terry Farina, Peg Foster, Dennis Kirtland, Ken Hamon, Jim Fleming, Curt Reimer, Joe Prinster, the first Chairman, and our first Executive Director Rick Leach. Their initial fundraising campaign raised $1.5 million to begin the process of attempting to recruit an array of diversified businesses to the Valley, to bring jobs and people back, and to insulate the area from the ongoing boom and bust cycles in the energy sector. We decided to contribute to that effort then, and we continue that investment still today. Over the years, there has been a lot of debate about whether or not to fund economic development. As a private business owner, it’s always been a conundrum because we are most likely funding an effort to raise the cost of hiring and retaining our own employees. While that may indeed be true, I believe the benefits far outweigh the negatives. When our local economy grows, we all grow together making our community a better place for every one of us. Since those early days on the MCEDC, I remain an advocate for proactive economic development. The results of those early efforts and the ongoing success of GJEP are very evident in our lives today. While there is no way to insulate ourselves from downturns on a national level, we have had a great deal of success diversifying our economy over the years in ways in which we all reap the many benefits. This year, as I take on a more prominent role in support of Robin Brown and her talented team at the Grand Junction Economic Partnership, I hope you will join me with your support by investing in this ongoing effort for which I believe to be of great importance to us all. SUPPORT PROACTIVE ECONOMIC DEVELOPMENT IN THE GRAND VALLEY – INVEST IN GJEP TODAY.